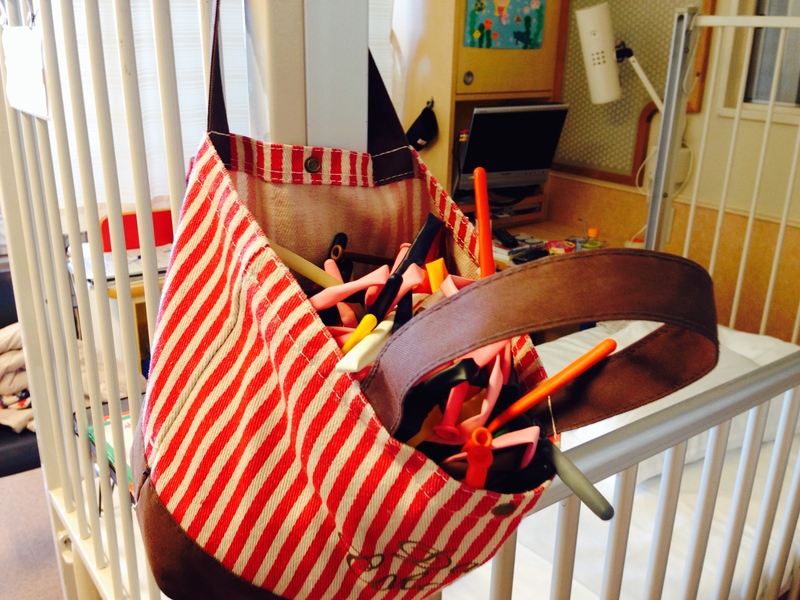 NIKONIKO Taishi Guy presented a balloon animal/flower/bugs/vehicles/airplanes… to every child at his/her bedside. 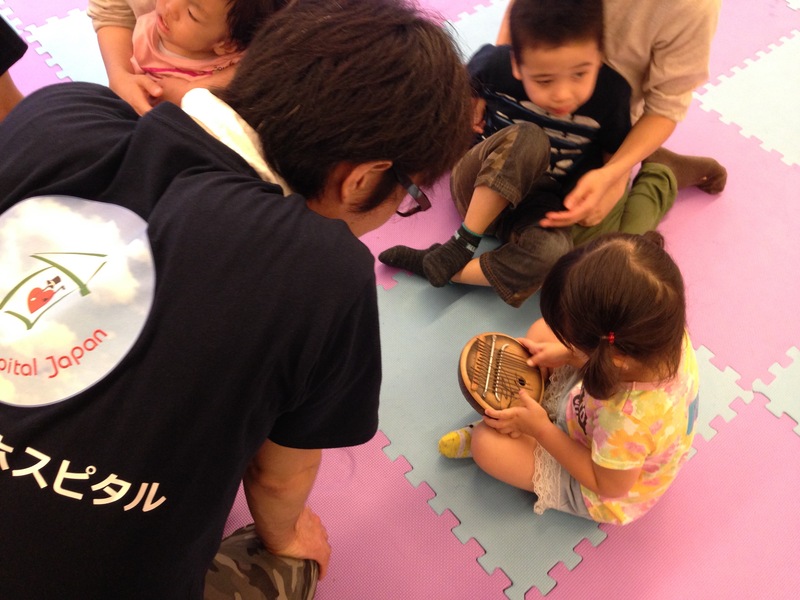 After the play/show time, small kids got excited to touch ukulele and had lots of fun. Jazz & blues for kids and mothers. The ward staffs joined too. 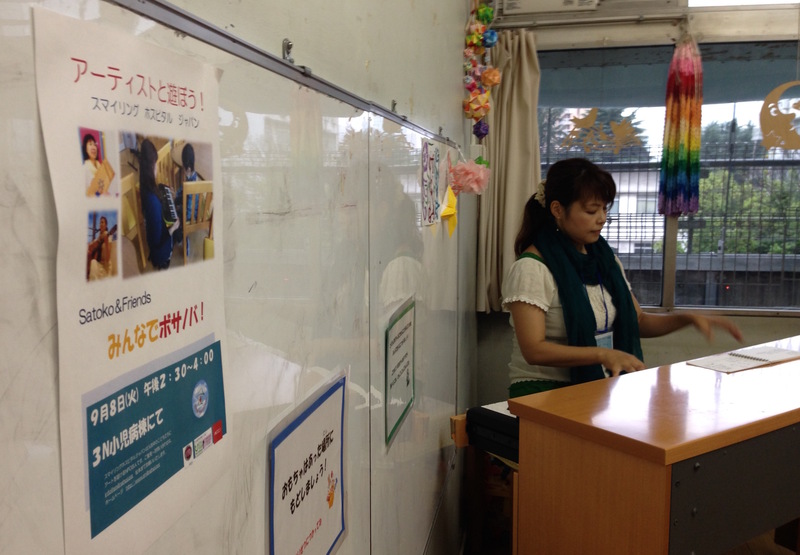 Kazuko-san sang songs to the piano for a mother and a baby who requested some songs to listen from inside the bath room. A boy crying alone in his private room stopped crying and enjoyed beating time with his hands to “Anpanman”, then did “high touch” to say good bye with smile. 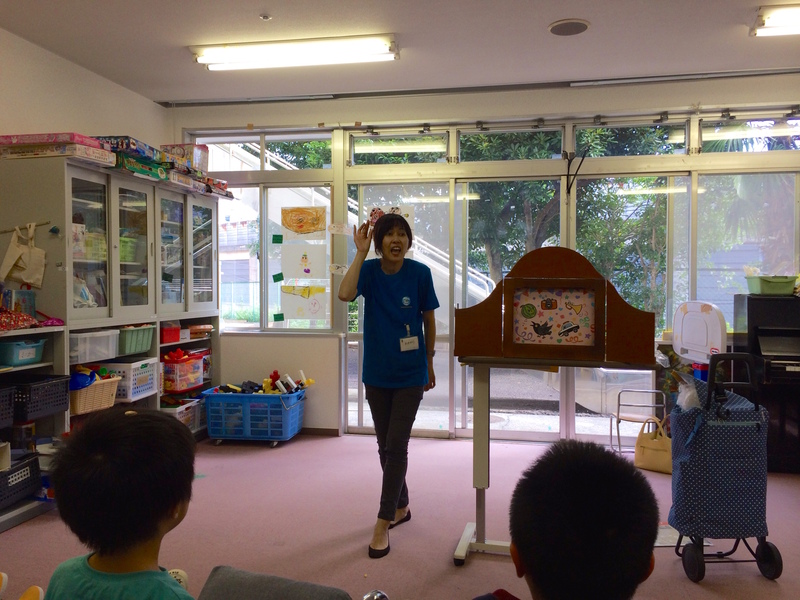 Some patients from foreign countries were in the ward and they really enjoyed Kazuko-san’s jazz and blues as well as kids songs. 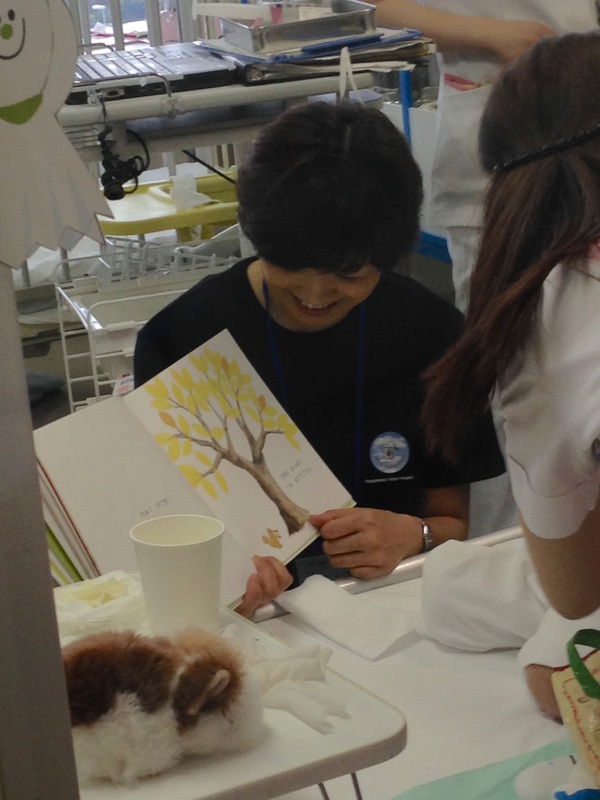 Story telling by an announcer & picture book therapist, Machiko-san. 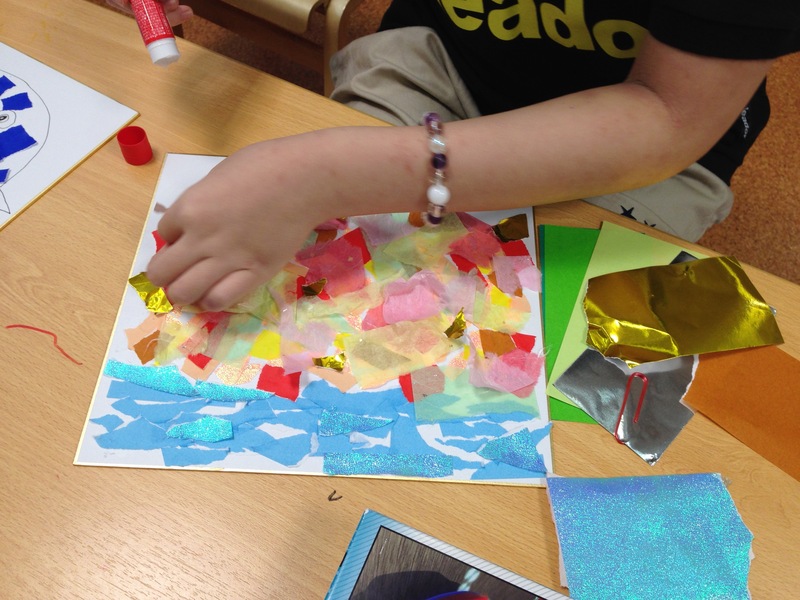 The stories went on as children touched the picures, which made them feel like they were making the stories and playing in them. Her tender voice and beautiful smile made children, mothers and fathers smile. 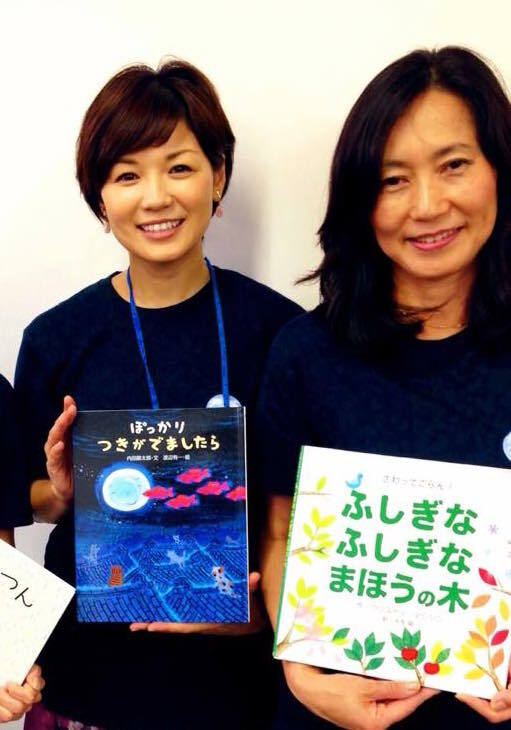 One on the left is Ms.Machiko Kondo and the other is Ms. Mieko Shirao, an assistant volunteer in charge of Keio University Hospital. 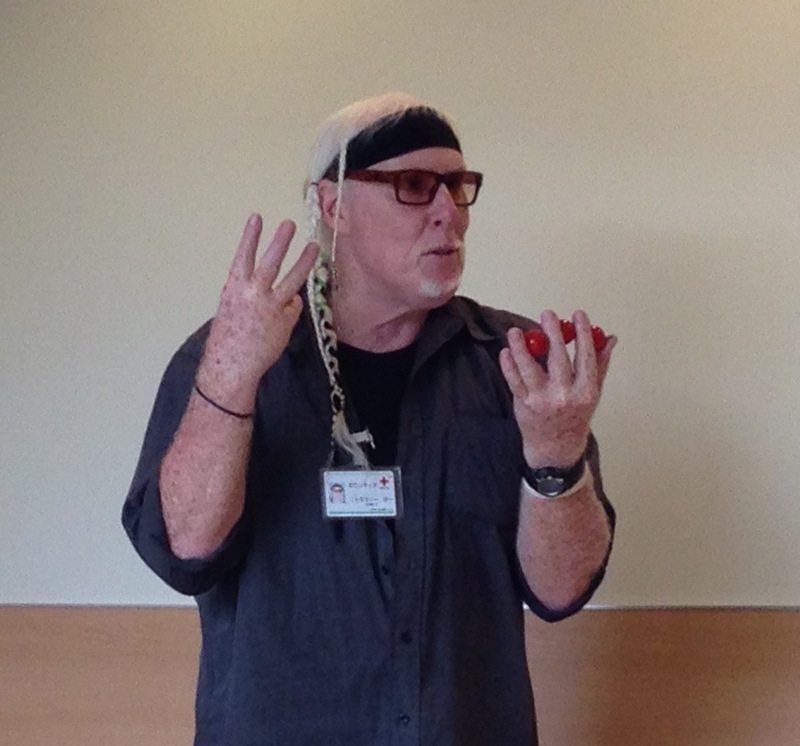 After the show in the ward, Guy-san visited the room for taking care of patients’ siblings during their parents staying in the ward and presented balloons. Around 27 kids and parents joined the acitivity. Making collage after drawing outline, tearing papers and pasting on the card at the same time, or making up the image by the color…the processes are all different. 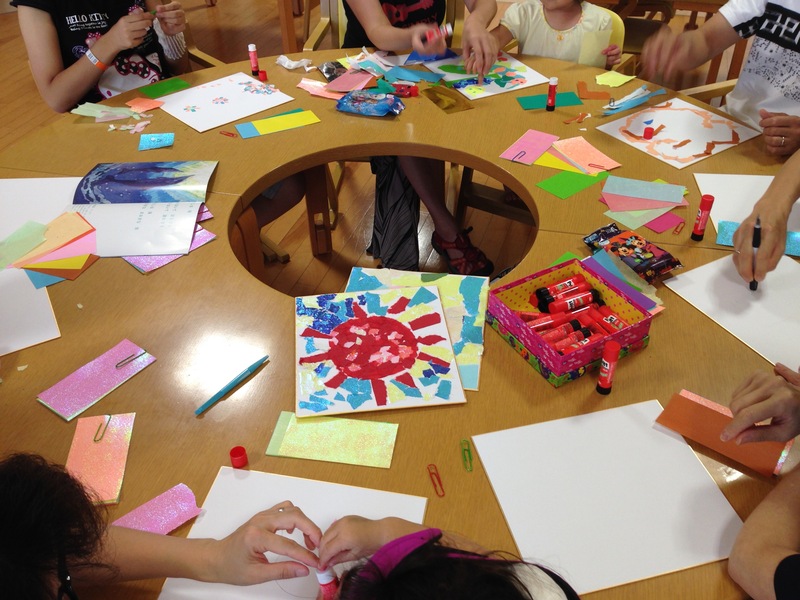 Getting together and making something produces the chance to have communication between children of different ages, families and mothers. This is one of the meanings of our activity. 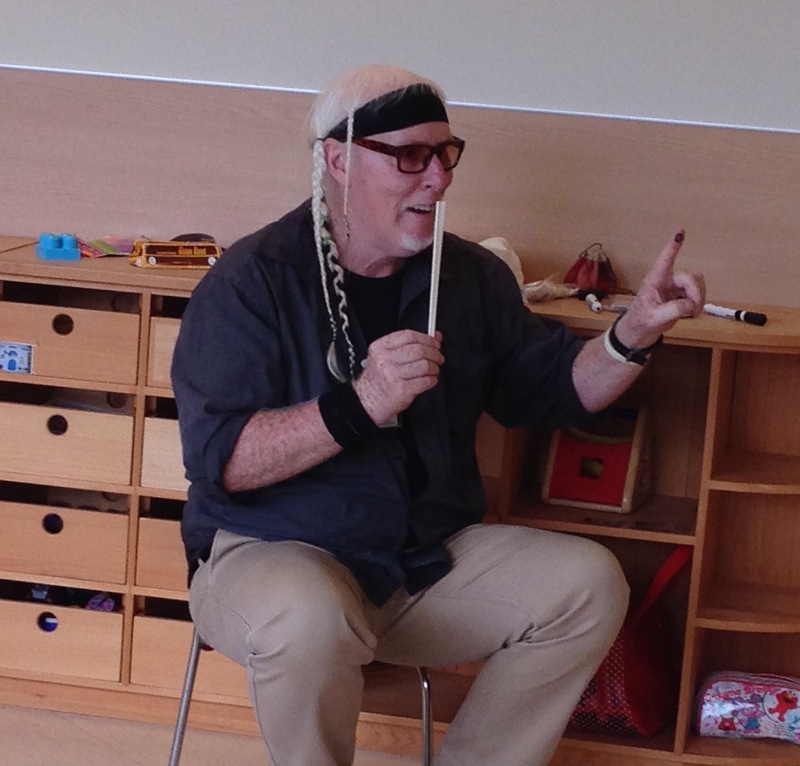 Children enjoyed Cloudy’s revealing the secrets behind his tricks a lot. But he never forgets to tell kids not to give away his magic. 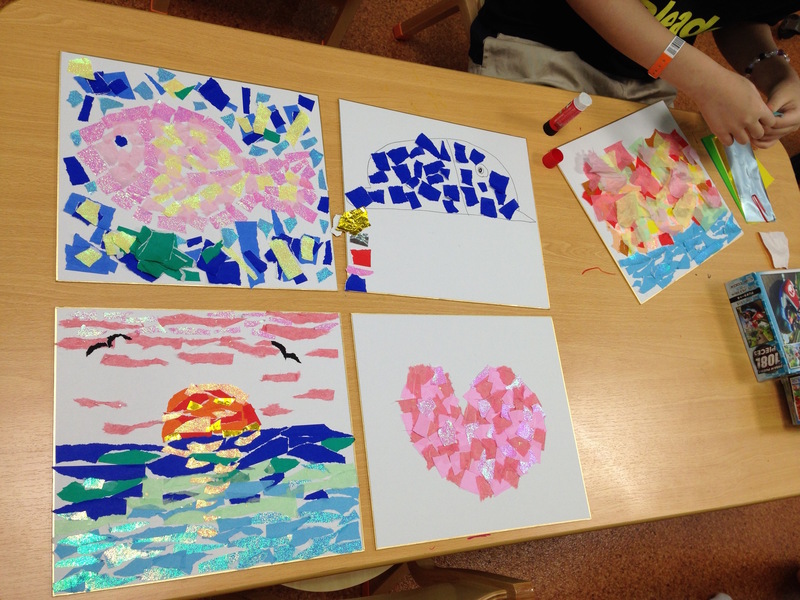 Children were really having fun. On he and children starting to pretend to cry, the boy really having been crying just stopped crying. Soon everyone looked at each other’s face and began to laugh out. It was real magic of Cloudy. He always makes the ward filled with smiles and laughter by skills all his own like funny talk, wonder of tricks as well as his unique & magical world of changing kids face into really happy faces. 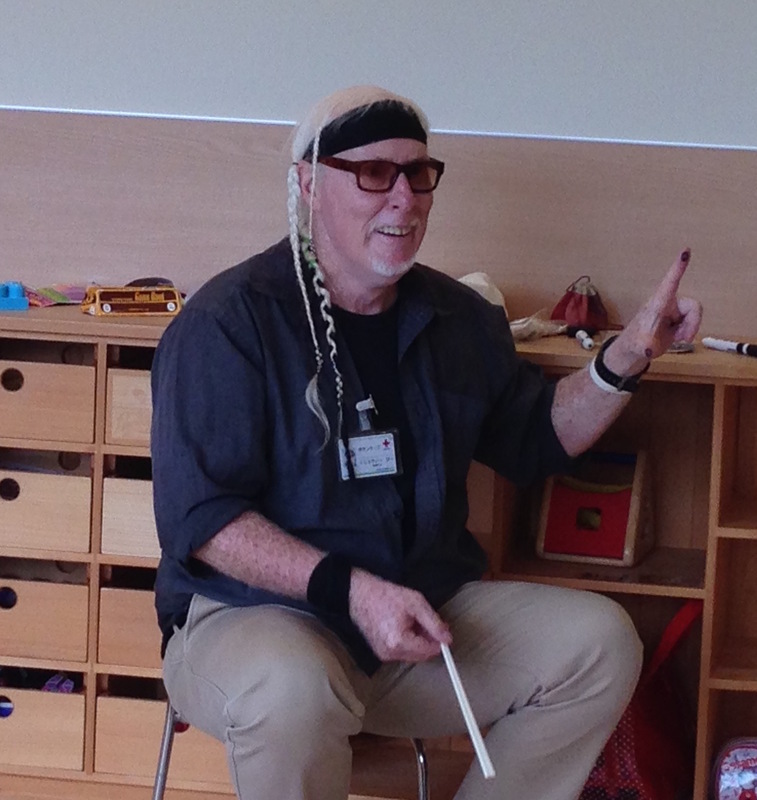 Varied activities of story telling with music and craft workshop never made children lose interest. They had such a fun time that only 1 hour was not enough at all. They will be looking forward to having a good time with Yukari-san again soon. 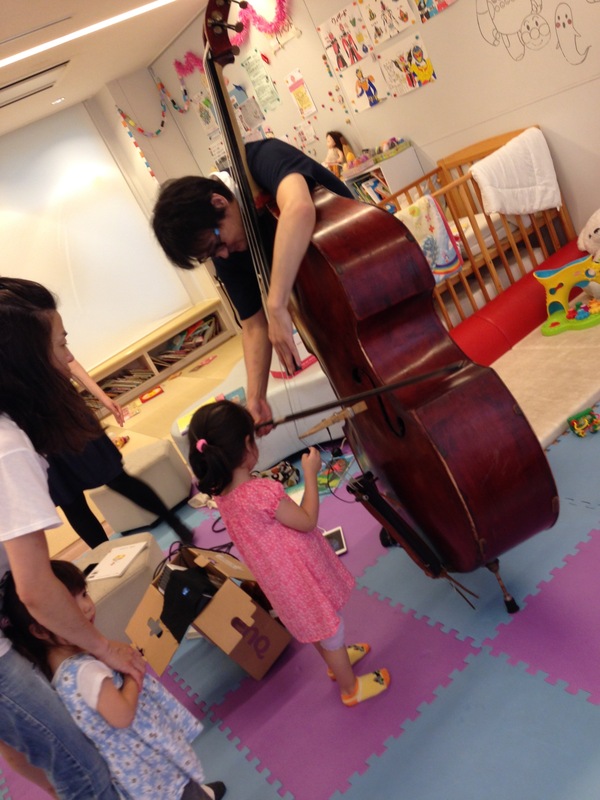 Story telling with the contrabass playing was such a rare style of story activity. Children made their own shakers and joined the stories. 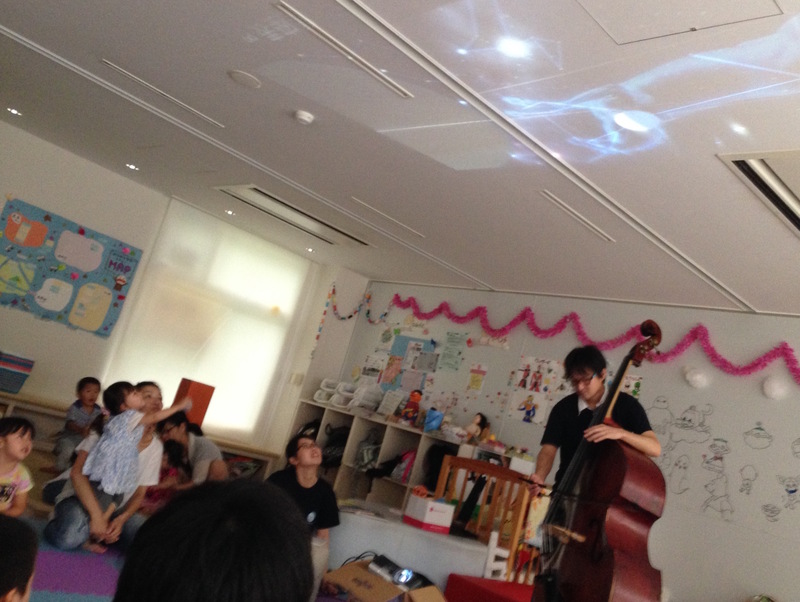 Another surprise was Azumi and Mitsuru’s reading of stories and poems projecting slides of pictures and constellation on the ceiling. 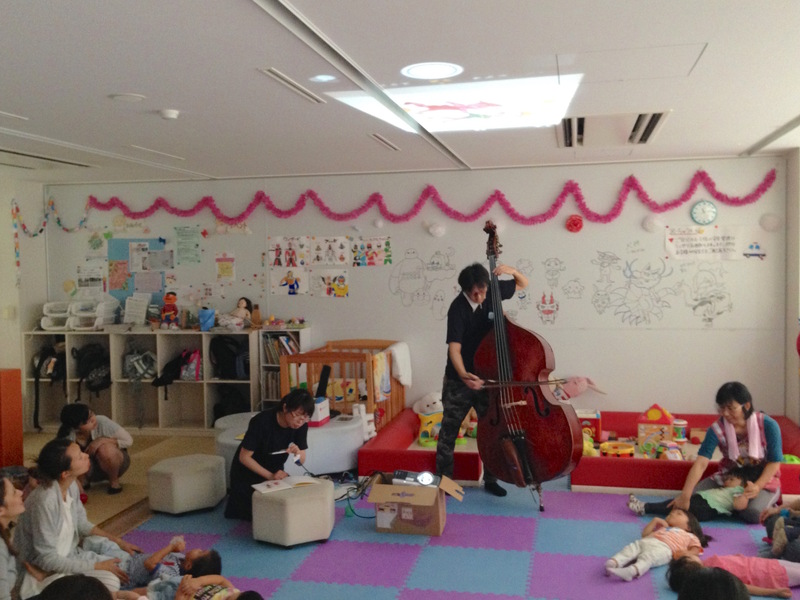 Physically handicapped children enjoyed lying on the floor relaxed and watching pictures above.They also enjoyed touching and playing the big contrabass and ethnic musical instrument. 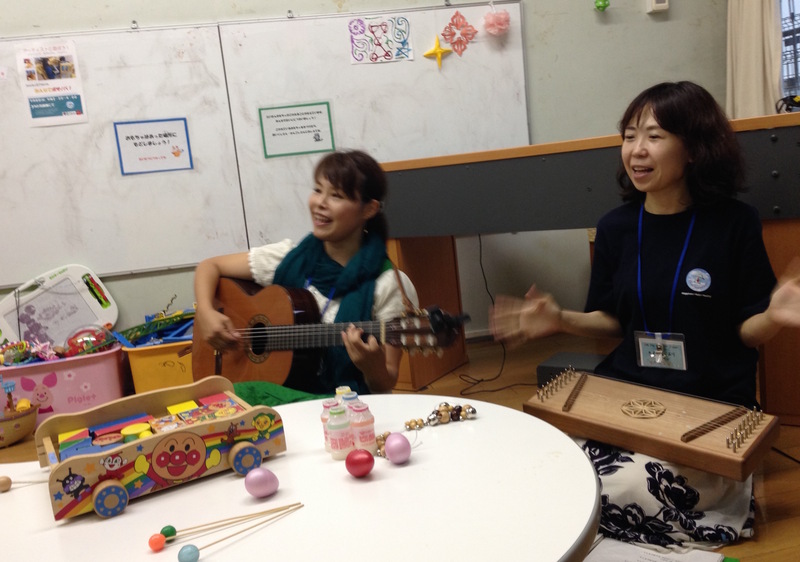 Children like Bossa Nova because of its rhythm like they also like jazz. 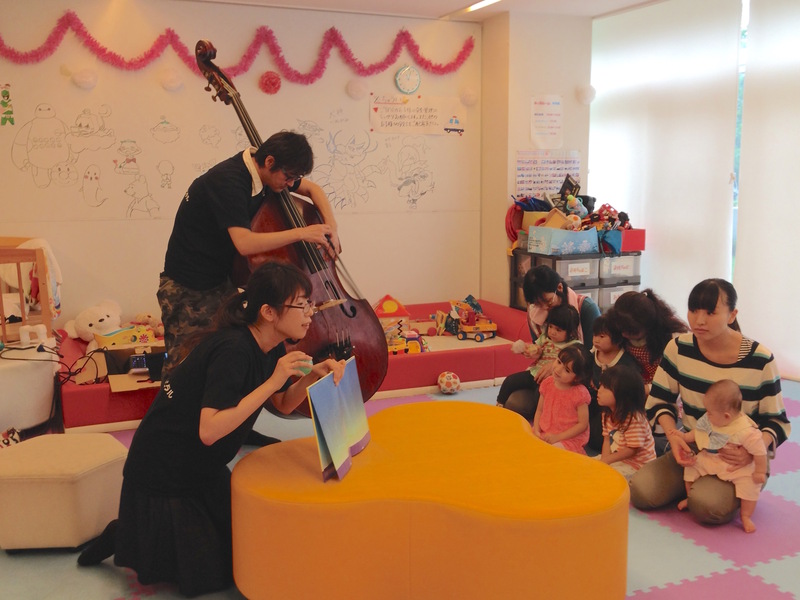 Though there were few children in the playroom at the beginning as some had just been discharged and some had just finished surgery, some school girls came together to the playroom attracted by Satoko-san’s guitar and singing. 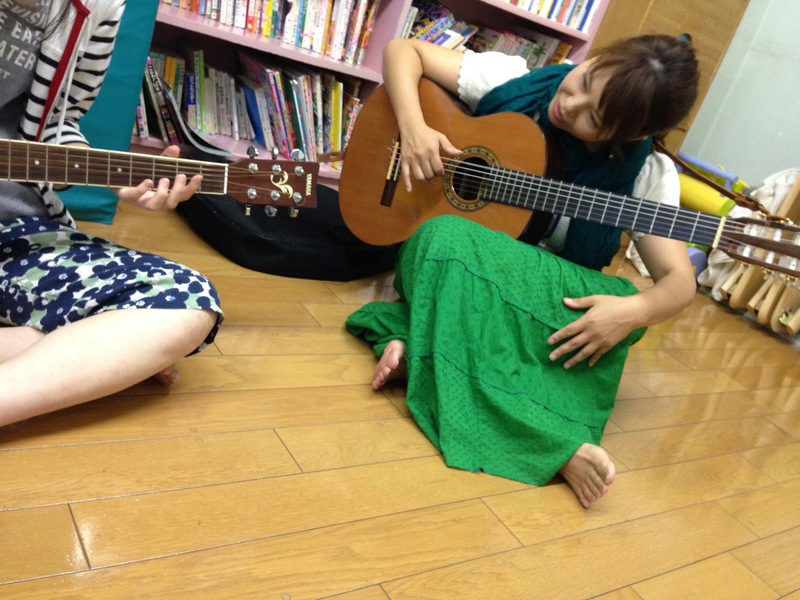 One girl brought her guitar from her room and had a guitar lesson by Satoko-san. 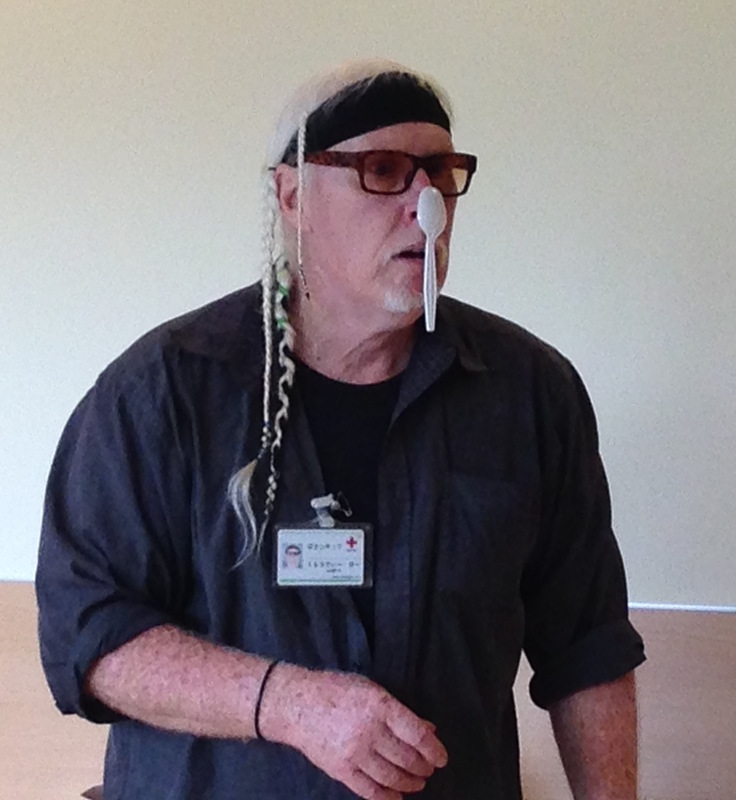 Their collaboration captured people in the ward and let some gathered.